Sometimes my six month old son takes his time falling asleep at night. He likes to be fed and rocked and cuddled and fed again. When I’m low on patience, or have a million things waiting for me to do once he does fall asleep, this can drive me crazy. But then, once he is fast asleep in my arms, mouth open, gently snoring, I run my hands over his small bald head and soft round cheeks and there is love, too much love. When they’re awake, toddlers are crazy and loud and hilarious and exhausting. And when they are asleep and the house is warm and quiet, they are all kinds of perfect. Before I go to bed I always sneak into W’s room, tuck her into the blankets that she has inevitably thrown off herself, stroke her hands and flyaway curls and kiss her cheeks and there is love, too much love. And during the in between times, love is mixed with exasperation, and a fair sprinkling of chaos. The good kind. Mostly. We go for walks that take forever as W stops to pick up rocks and pick flowers and detour into other people’s gardens. We play on the bed and T giggles full belly laughs playing peekaboo. They cuddle each other and roll around together, all fun and games until one of them gets poked in the eye, or kicked in the head, and tears ensue. And then, on the days when the mornings have been peaceful and they both go down easy for long midday naps, and the late winter afternoon sun is flooding the verandah out front, and I can breathe slowly in the momentary silence, I eat. Sometimes it’s a lunch of toast and quick things, but when I do have the time I like to prepare something a little more involved. Nothing too fancy, just something warming and filling and full of flavour. 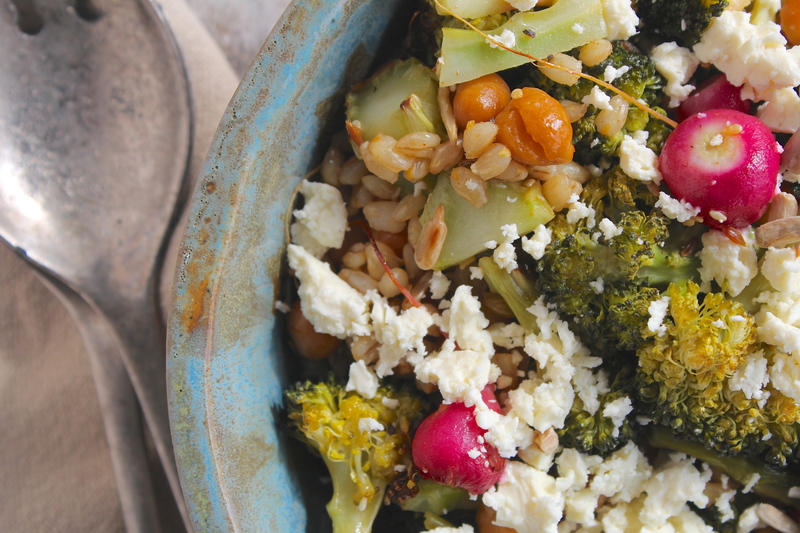 This Roasted Broccoli, Barley & Feta Salad that I made last week hits that sweet spot between good wholesome fare and a meal with a little bit of oomph. 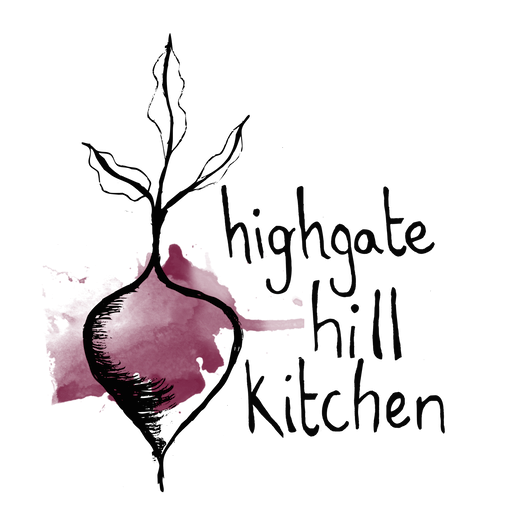 It is another warming grainy salad; an ideal winter lunch, or late autumn dinner. I feel like barley is an overlooked grain. It’s usually just thrown into vege soups – and it is absolutely delicious that way – but it makes such a great part of a grain salad. It has a dense chewy texture but is still light, and mild but nutty in flavour. 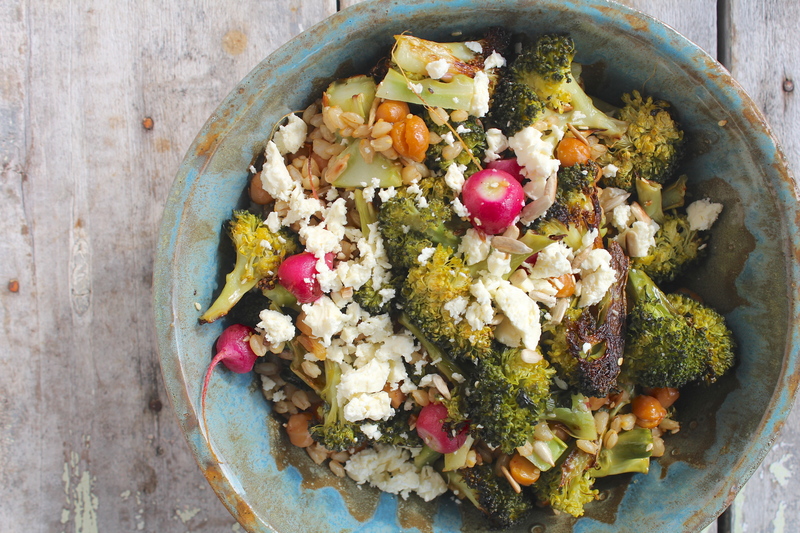 Though I usually eat broccoli lightly steamed, reveling in its crispy crunchy greenness, broccoli roasted almost to the point of charring is absolutely all kinds of moreish. The feta brings the salty cheesy texture contrast and roasted chickpeas turn this salad into a nourishing meal all on its own. And let’s not forget the preserved lemon dressing, of course. Preserved lemon is one of those ingredients that makes any old dish something special. Chop the broccoli into small florets (Deb over at Smitten Kitchen has a great tip for cutting broccoli without losing too much of the florets). Also chop the broccoli stems into small chunks – if the broccoli is fresh, young and tender you won’t need to peel the stems, but if not just peel the outer layer before chopping. Top and tail the radishes and, if they’re large ones, cut in halves or quarters. Oil a baking tray and place the broccoli and radishes in a single layer. Roast for approx. 35 minutes, until the broccoli is tender all through and crispy on the outside. Remove and set aside. In a bowl toss the chickpeas together with the tablespoon of oil, juice of half a lemon, cumin seeds, paprika, and a pinch of salt. Pour it all out into a baking tray and roast in the oven for 30 minutes, tossing halfway through (you can pop these in the oven at the same time as the broccoli). In the meantime, add the barley to a small pot along with one and a half cups cold water. Cover, bring to a boil, then lower to a simmer and cook until all of the water is absorbed (approx. 20 minutes). The barley should be tender but still chewy – you may need to add a splash more water towards the end of cooking. Dry toast the sunflower seeds in a pan over a high heat, tossing continually for 4 – 5 minutes, until the seeds start to brown and smell toasty. Prepare the dressing. Remove the pulp from the preserved lemon half and dice. Finely chop or crush the garlic clove. Combine the preserved lemon and garlic in a small jar along with the quarter cup of olive oil, lemon juice, and cumin seeds. When everything is ready, assemble the salad. 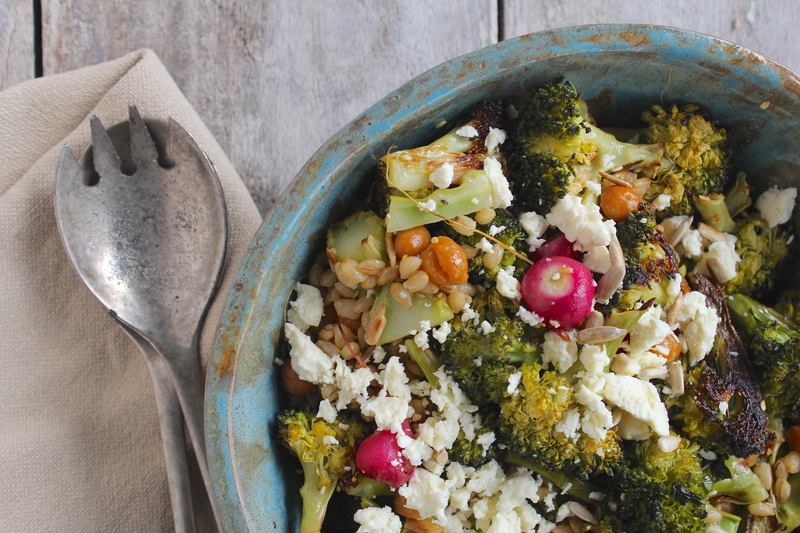 In a large bowl combine the barley, chickpeas, broccoli and radishes, and sunflower seeds. Mix to combine and stir the dressing through. Using your fingers crumble the feta cheese over the top. Eat immediately, while still warm. 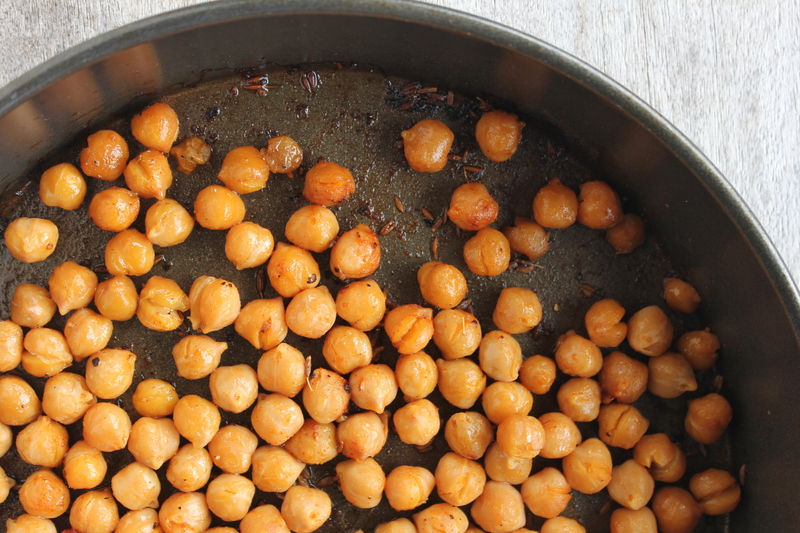 Notes: if using canned chickpeas go ahead and use the whole 400gm can (it will be a little more than the one cup). If you don’t have any preserved lemon use the rind of a whole lemon instead. And while this salad is best while still warm, it will keep well in the fridge and still be delicious cold the next day for lunch. This sounds great, my kind of salad indeed. I love barley and often try to find other ways to use it than just soup – I’ve even made porridge with it before! I’ll definitely have to give it a go in porridge! I usually throw millet, buckwheat & quinoa in my porridge, so why not barley?! I blend the barley with rice milk to get a smoother texture, add a little fine lemon zest and a drizzle of maple syrup…so delicious! LOVE salads like this! 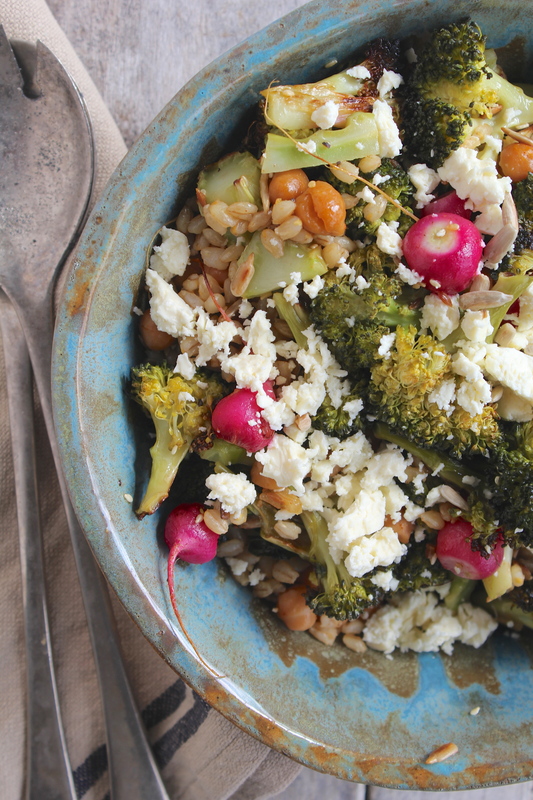 So full of flavour with all that charred broccoli and feta and so super healthy as well! Will definitely be giving this a go, thank you! You’re a good example of how women can take time for themselves and feed themselves well, even in the midst of a busy day. I think you and I share a love for broccoli. Just roasted off a broccoli, tempeh, and chickpea mix last night but I also usually make and crave steamed broccoli. 🙂 This is of course another delicious looking salad of yours. Love the preserved lemon dressing especially. Preserved lemon makes everything delicious. 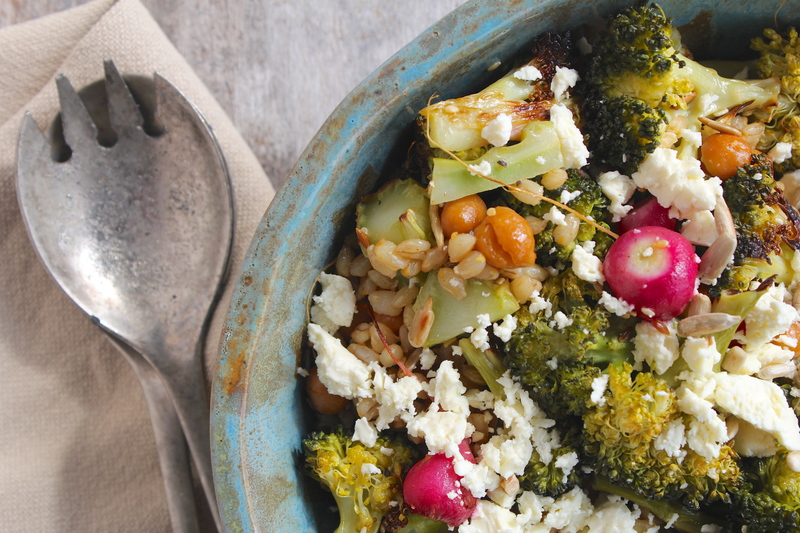 And broccoli is definitely my fave – we go through at least two bunches of it a week!